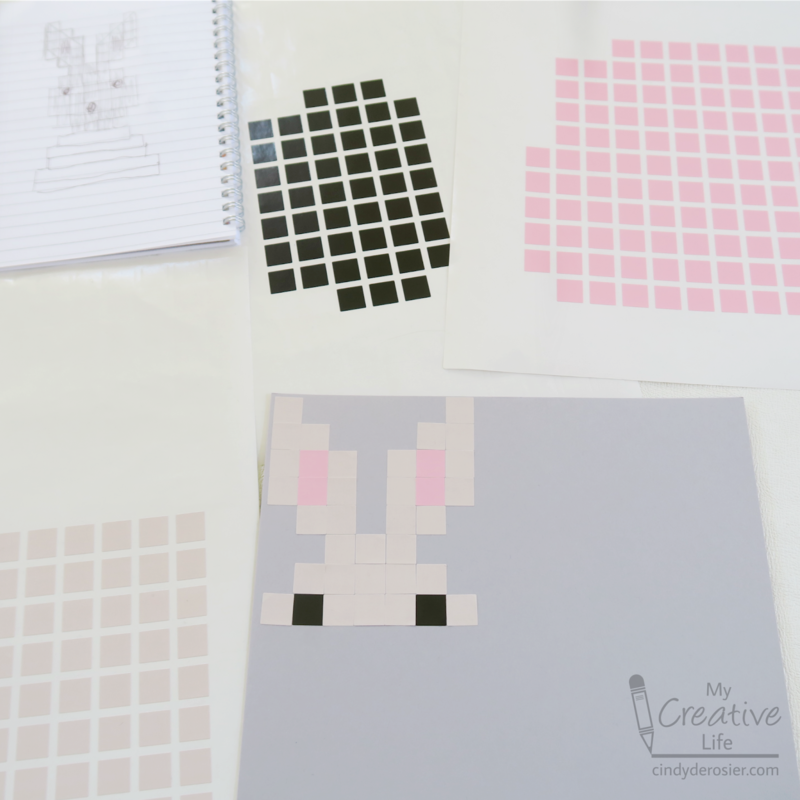 Cindy deRosier: My Creative Life: Bunny Week, Day 1: Pixelated Bunny Craft and a Giveaway! Bunny Week, Day 1: Pixelated Bunny Craft and a Giveaway! Welcome to Bunny Week 2019! Bunny Week is an annual tradition here at My Creative Life, a chance to celebrate All Things Rabbit. 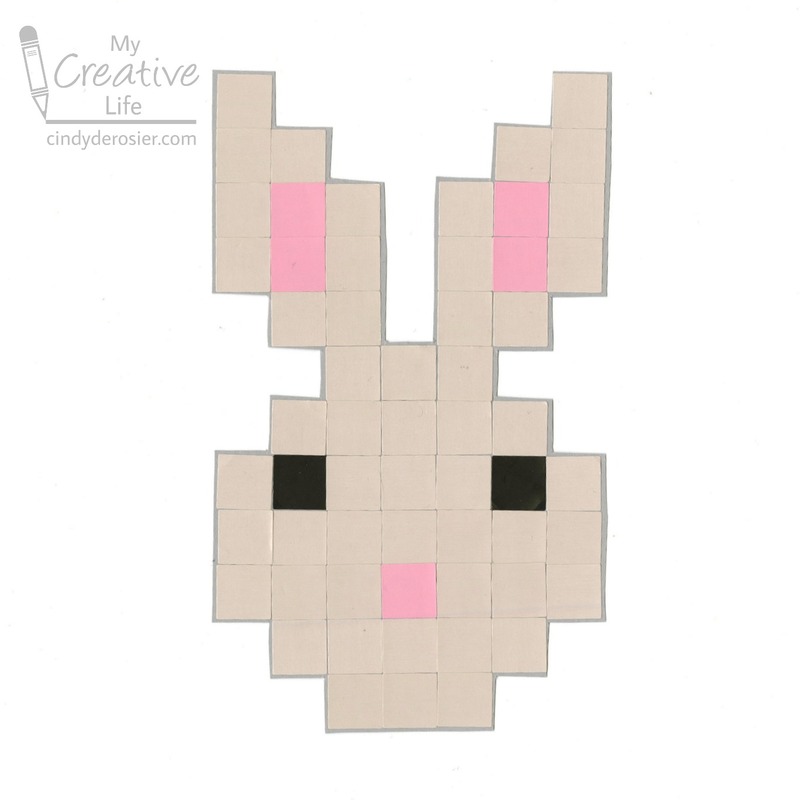 I'm starting off Bunny Week with a pixelated rabbit craft. Place a tan sticker in the upper lefthand corner of the construction paper, leaving a small (and hopefully even) gap between the left and top sides. Line up three more tan stickers immediately below that, leaving no gap between the stickers. Start the next column down one square to shape the bunny's ear. Continue to fill in with stickers. It is easiest to first work down the left ear, across the top of the face, then up the right ear. Complete the rabbit's face. 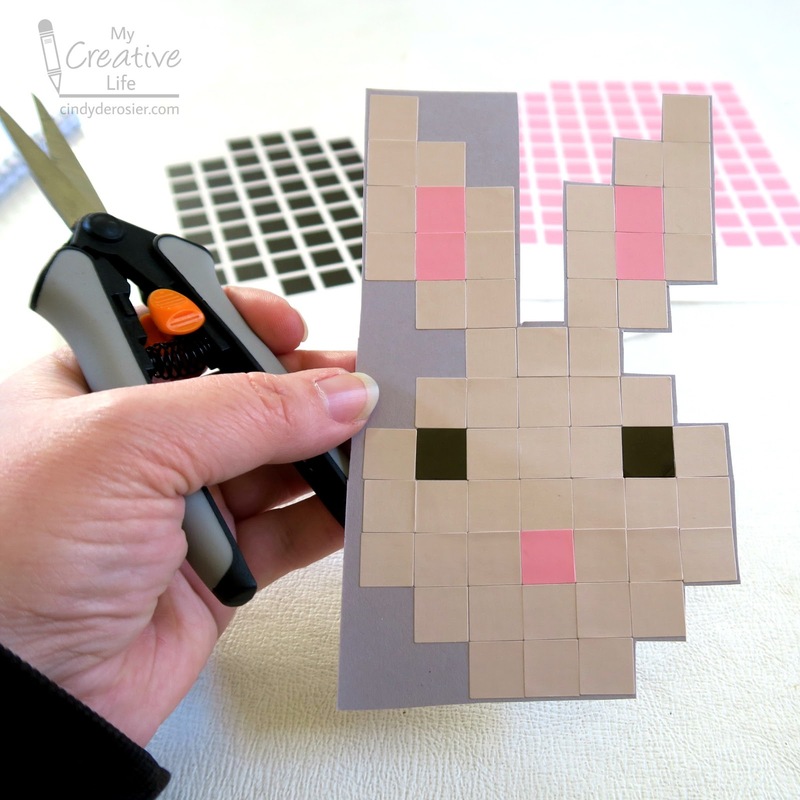 Use the scissors to carefully cut away any excess construction paper. That's all there is to it! And obviously, this isn't limited to bunnies. Use your extra StickTogether stickers to make any sort of animal, design, or pattern that you can dream up! Now for the exciting news- my friends at StickTogether are giving away a kit to one of you! Even better, you get to decide which one you'd like to win! Simply follow this affiliate link, browse through their designs, then leave me a comment with which one you'd most like to win. If you can't decide, just list a few you like and if you're the winner, we'll surprise you! I'll announce the winner on Monday, April 1 (no fooling!) so get your comment in by then. The Butterfly is beautiful, but the Snowflake is the one I could see doing with my nephews. Cute bunny! Happy Bunny Week to Trouble! <3 I like the "Under the Sea" one the best! BTW - though I could totally google this question, I'm going to ask you instead: what is the difference between a bunny and a rabbit? There isn't a difference. Rabbits and hares are different kinds of animals, but rabbits and bunnies are the same thing. Some people use bunny only for babies, but a baby rabbit is actually a kit. Well, I know that rabbits are generally smaller, born blind, and hide underground from their enemies. Hares are larger and have longer ears, often with black markings in them. They run from enemies. And their fur changes color seasonally. My pleasure. Now do a post that answers all my questions about having a house pig! Ugh, the pressure! Hahahahahahahahaha! It would probably be easier/faster to Google! I'm seriously bad at explaining stuff! FABULOUS technique too => Thank You for sharing!